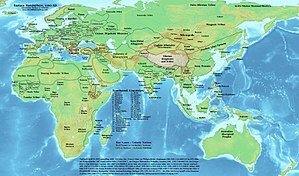 Khan (sometimes spelled as Xan, Han, Ke-Han, Turkic: khān, Chinese: 大汗) is an originally Central Asian title for a sovereign or military ruler. It was used by the Mongols who brought it to all over Asia. It now has many equivalent meanings such as commander, leader, or ruler. Presently, khans exist mostly in South Asia, Central Asia and Iran. The female alternatives are Khatun and Khanum. A khan controls a khanate (sometimes spelled chanat). Whenever appropriate as ruler of a monarchy, "khan" is also translated as king or prince. (But that translation is not quite correct.) Originally khans only headed relatively minor tribes. The title "Khan" became well known when the tribal Mongol Temüjin proved himself a military genius by creating the Mongol Empire, the greatest land empire the world ever saw, which he ruled as Genghis Khan. His title was khagan 'Khan of Khans', see below, but is often 'shortened' to Khan (rather like the Persian Shahanshah – also meaning 'King of Kings' – is usually called Shah, equally incorrect, in most Western languages) or described as 'Great Khan' (like the Ottoman Padishah being called 'Great Sultan'). There have been several variations on the title used in modern times. Khan Bahadur or Khan Sahib was a title of honour, granted by the British Raj to Muslims who had done major deeds of valour, or service to the nation or government. The Hindu counterpart for this title was Rai Bahadur or Rai Sahib. This title was normally granted in addition to other awards and decorations and added either before or after a person's actual name as a prefix or suffix. This page was last changed on 8 March 2015, at 19:01.